Clay brick, and especially face brick affords numerous cost-saving benefits for affordable residential living. Durability, longevity and natural thermal performance properties contribute to excellent thermal comfort and low cooling and heating energy costs year after year. Fired clay is well known for providing homes that promote healthy living including improved air quality and resistance to damp and mould. Brick is one of the strongest walling materials known to man, and homeowners can expect a life time of structural integrity and security. And all this comes at a competitive built cost and assured low lifecycle maintenance cost. 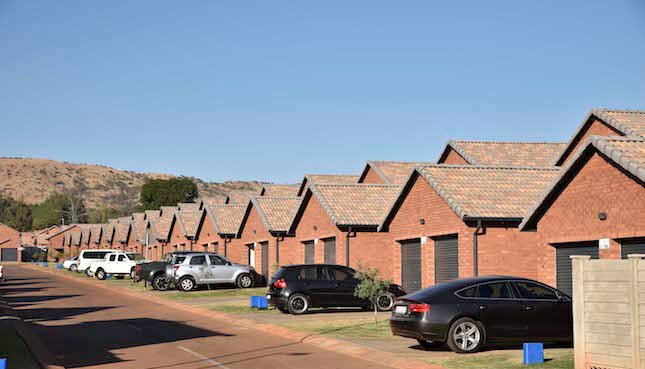 Owners at Platinum Manor, a new affordable housing scheme recently completed in Chantelle Pretoria, will enjoy the benefits of "clay brick for good", as the complex features 2.37 million Corobrik Moroccan Red Travertine face bricks. The new Platinum Manor development, designed by J A Venter Architects, consists of 220 houses built in two phases – North Village and South Village. Construction began in March 2014 and the last house was completed in June this year. There are three types of houses, 100 m² 130 m² and 140 m², each with a loft, with complex conveniently situated close to a shopping centre and a hospital. The Platinum Manor houses are rented by young families, couples or single professionals. “And the basket of value benefits that those living in brick homes take for granted does not end there,” elaborated van Heerden. “Consider for example the inorganic qualities of fired clay that ensure an indoor air quality that is virtually free of pollution and clay brick walling’s natural ability to absorb and release humidity from the atmosphere to help create a good humidity balance inside the home, reducing the risk of mould growth and the chance of sick building syndrome. Add to these the natural fire resistance and sound proofing qualities of clay brick and clay brick walling’s’ proven superior performance under extreme weather events, and it is understandable why brick construction continues to rule supreme with the home consumer – peace of mind is part of the deal”. “In the case of Platinum Manor, the quality of dwellings provided, linked to the authenticity of clay face brick for the external skin that addresses people’s aspirations to live in brick houses; will surely set the tone for the occupants’ climb up the housing ladder. We are extremely thankful for the opportunity Central Developments has provided to us to be a part of a process that enhances people’s quality of life,” added van Heerden. In the context of the South Africa’s environment, today’s sustainability imperative has elevated the value of clay brick construction with face brick to a whole new level that alternate lightweight building technologies will continue to but aspire. This is the second Central Development Projects affordable accommodation scheme in Pretoria for which Corobrik has supplied face bricks. A similar quantity of 2.4 million Moroccan Red travertine face bricks were used in the recent construction of the award-winning Little Manhattan apartment complex.